The rapid adoption and growth of Cloud computing is generating some interesting applications for modular UPS systems within the datacentre industry. Modular uninterruptible power supplies have been around for many years and UPS manufacturers tended to focus on either modular or mono-block UPS systems. After many successful years as a manufacturer of mono-block systems, Riello UPS has now entered the modular arena with the launch of their Multi Power Modular UPS system. Like most modular UPS system manufacturers, Riello UPS has designed a slide-in power module rated at Unity Power factor. Here the kW and kVA ratings of the UPS module are the same. In general terms this means that the UPS system can deliver more power than comparably rated UPS systems that might have 0.9 or 0.8 Power Factor rated output. The Riello Multi Power MPW-series UPS system is based around a 42kW slide-in power module. Up to 7 modules can be installed into what Riello terms a ‘Power Cabinet’ to give a total capacity of 294kW or 252kW in an N+1 configuration. Up to four Power Cabinets can be operated in parallel to give a total modular UPS system size greater than 1MW (1176kW including redundancy). A 42kW UPS module size might make the maths a little more difficult but when combined with the small footprint of the Power Cabinet (600×1050mm), it provides the Riello UPS system with another key advantage over competing modular UPS; the best kW/m2 ratio available. Another interesting aspect of the Multi Power UPS system is the new Riello UPS approach to battery packaging. As well as plug and play slide-in UPS modules that allow a UPS system to be scaled vertically in the same cabinet, Riello has also introduced slot-in battery units. These are self-contained hot-swappable battery packs. Up to 4 battery units fit on a shelf and a Power Cabinet can take up to 9 shelves (36 battery units). 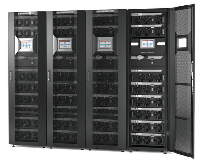 For longer runtimes up to 10 battery cabinets can be connected in parallel or clients can use one of the more traditional battery cabinets from Riello UPS used for their Multi Sentry or Master UPS systems. Whilst the larger sized Multi Power units should appeal to large datacentres and those looking for a centralised UPS system, the Combo arrangement may well be ideal for smaller to medium sized facilities. Especially those looking for in-row power protection and a distributed power continuity plan. As the name implies, the Combo Cabinet provides the option to house up to three UPS power modules and five shelves of battery units giving a total power output of 126kW or 84kW with redundancy and from a 5 minute runtime. The Riello Multi Power UPS system is designed around multiple advanced microprocessor controls to ensure operation reliability and stability. Each Multi Power module has three microprocessor units, each assigned different functions. The Power Cabinet itself has two further microprocessors with one assigned to regulating overall system operation and the other user communication. Each Power Cabinet has four temperature sensors and the fans are speed controlled for load and temperature. When the slide-in battery units are used, each again is monitored and controlled and features internal protection. Multi Power is also designed for advanced monitoring and control communications. The 7inch touch screen LCD front panel and remote communications interfaces provides users with a range of system information from an initial schematic overview to the ability to drill down and view the operational information of each power module and battery pack. Multi Power will easily integrate into any network system and Data Centre Infrastructure Management (DCIM) package. Multi Power is designed for the fast-growing datacentre operator who wants flexibility when it comes to scalability and resilience but how does it fair when it comes to critical power supply delivery? Riello UPS has always been known for its mono-block UPS systems, advanced transformerless and transformer UPS technologies and high operating efficiencies. It comes as no surprise then that the Multi Power is designed to provide a secure power source and has many of the industry leading features designed into its other UPS systems. The UPS electronics are designed to work at up to 40°C even without derating with a wide input voltage range of +20 to 40%. Operating efficiency in full on-line VFI mode is greater than 96.5% and even when low loaded can achieve an outstanding electrical efficiency performance of greater than 95%. The UPS modules also have a three level Neutral Point Clamped (NPC) inverter and Power Factor Corrected (PFC) input control to provide a near Unity Power Factor input and minimum harmonic impact on the local input power supply (mains or generator). The Multi Power UPS system provides Riello UPS with a complete line-up of datacentre uninterruptible power supplies and the opportunity to supply either mono-block or modular systems. Whilst the price for a Multi Power UPS will always be higher due to its more complex design, the benefits in terms of scalability and reduced service costs should well off-set these. At EcoPowerSupplies we have developed a core skill set in the specification, design and installation of modular UPS systems and now supply the new Riello Multi Power UPS as part of our product range. For impartial advice and assistance in designing a critical power supply for your datacentre application please call 0800 210 0088.